From one of the sports world's most celebrated hockey writers--a companion volume to his heartwarming Home Ice. Second only to family, the game of hockey is the tribe to which sportswriter Jack Falla passionately belongs. If Home Ice let readers in on the role hockey played in his early life, Open Ice takes them on a trip beyond his backyard rink to a reunion of the six living members of the five-Cups-in-a-row Montreal Canadiens of 1956-60; his chat with the legendary Alex Delvecchio; the "rink rats" of Boston, fans who played hockey at all hours of the night; and a memorable Bruins game with his grandson. 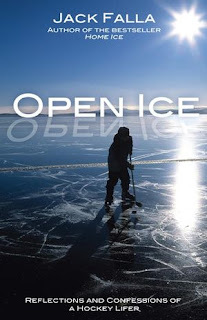 A collection of essays that touches on hockey's greats, like "Rocket" Richard and the mysterious Hobey Baker, as well as the game's enduring nostalgic power, Open Ice is a treat for hockey lovers everywhere. Jack covered the National Hockey League for Sports Illustrated in the 1980s. During that time he combined with SI photographer Heinz Kluetmeier to produce the book Sports Illustrated Hockey. much looking forward to Open Ice.